US Republican presidential candidate Mitt Romney addresses the National Association for the Advancement of Colored People (NAACP) annual convention in Houston on July 11, 2012. The first sign that Barack Obama's demolition job on Mitt Romney's record at Bain Capital was going to be a doozy came on May 21 at the NATO summit in Chicago, of all places. Obama was asked a question about his campaign's first round of attacks on Bain, which had been criticized by Newark, N.J., Mayor Cory Booker and a few other Democrats. The President could have chosen to give a quick "This isn't the place to talk politics" answer. But Obama not only chose to answer the question; he answered it at length. He made a bulletproof case for putting the Bain style of capitalism at the center of this campaign. It may have been the most important 617 words uttered by either candidate this year  and it offers a preview of what is about to transpire in the next few months. The second level of the assault was a character attack: Why wasn't Romney releasing tax returns from the years when he was hauling it in at Bain? This was a much fatter target. 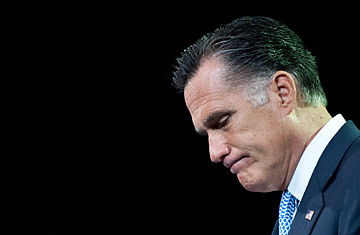 During the Republican primaries, Romney had shown an impolitic reluctance to reveal even one year of his tax returns. We can assume that the 14% he paid in federal taxes during 2010 was a high-water mark. It's possible there were years when Romney paid no taxes at all. This is not to say he cheated. It is to say that the rules of the game were tilted, unfairly, in his direction  which points the way to the most important, intellectually coherent and utterly proper level of the case against Romney and Bain. This was the case Obama previewed at the NATO summit and to which he will return as soon as the Romney campaign stops shooting itself in the face in response to the populist attacks leveled by the Obamians the past few weeks. I should note that among Democrats, who've spent decades watching their presidential candidates be pinned down by bazooka-wielding Republican operatives like Lee Atwater and Karl Rove, there is transcendent glee as the Romney campaign makes donkey-style mistakes, like stumbling into "retroactive retirement" locutions and whining about the unfairness of it all. What's the real case against Romney and Bain? In Chicago, the President said that private-equity capitalism was a "healthy part of the free market ... But understand that their priority is to maximize profits. And that's not always going to be good for communities or businesses or workers ... When you're President, as opposed to the head of a private-equity firm, then your job is not simply to maximize profits. Your job is to figure out how everybody in the country has a fair shot ... Your job as President is to think about, How do we set up an equitable tax system so that everybody is paying their fair share?"